I am a big fan of cool music. But again I wouldn’t spend my hard earned cash on headphones that don’t give me quality music sound. I therefore am doing this article for those of looking for the best closed back headphones under $300. Though quality sound is the key thing when choosing a headphone to purchase, you will agree with me that a combination of other features play a critical role on the choice. For example good sound complemented by style and portability. What to consider when buying a closed back headphone? Material make and on-ear swiveling. 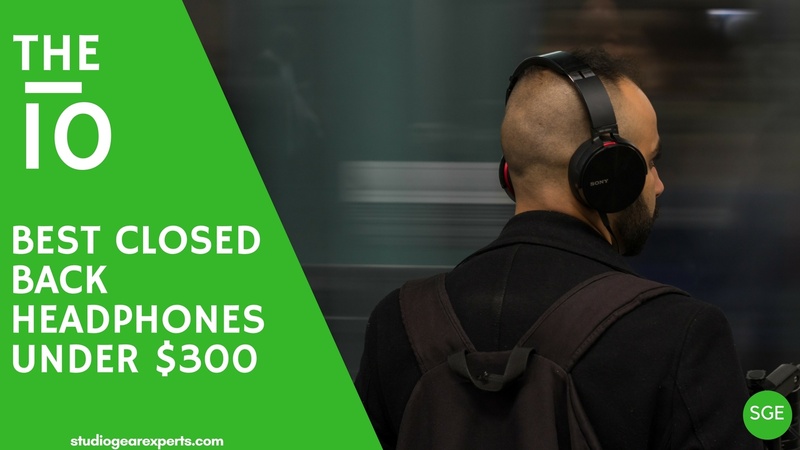 We have tried to analyses some of key features in some of the best closed back headphones below $300. Whether you are looking one for $100, $200 or slightly above $300, we've something for you. If you are looking for a headphone to provide you with a feel at home feeling, then you should consider PSB-M4U1. It is fitted with sonic high quality loudspeakers with expertise of over 40 years by the PSB Company to give exclusive room feel. Another thing we loved about these headphones, is their ear pads. They are self-adjusting and gyro-suspended to ensure that they fit well on your ears. They are additionally soft to ensure that you only get the musical feel. With your audio devices most of them portables like music players, smartphones etc., you will need portable headphones. PSB-M4U is amazingly lightweight and can be carried along and packed for outdoor. Interestingly, they are free from the tangle demon that affect other sets of earphones and headphones. This is because its two cords are tangle free. In case you are listening to music on your headsets, you don’t have to unplug to take calls. The cables is fitted with a microphone to allow you receive and make a call. Listening is always on an elevated level while using this device. High precision in balancing the cables and hardware ensure balanced audio output, quality, vibrations and noise free sounds. We considered this to be among the best headphones for smartphones. This is because of its uniquely configurable microphone attached to the cable to allow personalization of music, receipt and making calls without unplugging the device first. Other than being compatible with smartphones, it is possible to route it with online apps like smart key through the inline remote. This allows one to control sounds from what they are listening from their smart devices. Two cables- allow flexibility in listening. Performance of the remote control may depend on the smartphone. One of the reason we ranked this device as one of the best closed back headphones is its noise cancellation technology. This means that the final audio output is not affected by the head movement of the listening. Other than being made of foam ear pads, they have a 360 degrees swivel. This is to mean that they are unidirectional. As a listener you are served with the most convenient listening session. We can recommend this device to a person looking for a boom and clear music. It has high responsive voice coils with responsiveness of up to 100 kHz. Due to their omnidirectional rotation, they can keep sliding. Let us introduce you to the worldwide first crowd sourced headphone. It is made of lightweight metal making them among the most portable headphones. Its crescent shaped over-the-ear cover plus the ultra-soft ear pads makes the comfortable to use even in crowded areas. This makes them to isolate external noises. We ranked this as among the best headphones for djs, gamers, techies, audiophiles and musicians. This is due to their clear deep bass and strong hi-hats. Another thing we liked about crossfade m-100, is the 3.5 jack. This makes it compatible and possible to use with most audio devices like smartphone, music players, iPhone, keyboard etc. Made with light weight metals making it very portable and easy to pack. We considered Bose comfort 35 as the best Wireless headphone. It has the most exceptional noise cancelation giving out the quietest and calm sound while still adding deep bass. It is spiced up with its easy Bluetooth connectivity leading to fast and prompt voices detections. In additional to providing clear music, it is fitted with dual microphone system and noise rejection which allow it clear both incoming and outgoing calls even in noisy areas. This makes it a convenient device to use while in windy places, hikes, bus terminals, football arena etc. To sum it up, it has an over 20 hour’s long life battery. It can further keep you for over 40hrs in the most convenient music session if in wired mode. This makes it one of the most versatile headphones for music lovers. We ranked Technica ATH-M50X as the best headphone below $300. Made of aluminum voice coils, it is high responsive to frequencies up to 20,000Hz. This makes it have an exceptionally deep and clean bass. While most of the headphones are key on bass, Technica has concentrated on quality clear sound and ergonomics. A keen observer will note that it is designed in a circumaural contours. This helps to isolate sound. If you are in noisy environment therefore, you will still be able to get clear sound from the headphones. We know other than enjoying music, headphone users would want to be comfortable. The concave ear cups can swivel up to 90 degrees. To add on this feature, it has a firm yet adjustable headband. These deliver unexplainable comfort to the user. If improperly adjusted at the headband, it can be uncomfortable. We hope this article navigates you well towards headphones will give you value for your hard earned cash. It is our believe that you have been informed on key features to consider and how different headphones compare.